The stone in the picture commemorates the site where Isaac Asimov was born in Petrovichi, Russia in 1920. A copper memorial plaque that used to be mounted on the stone is now kept in the village administration office to protect it from theft. 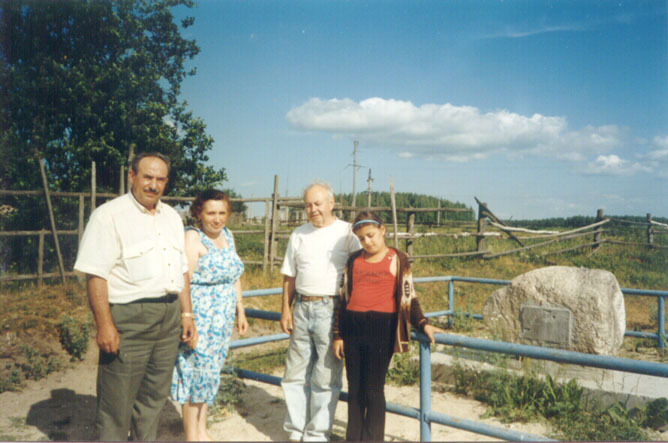 Pictured from left to right are Isay Azimov; a teacher at Petrovichi's local school; Isay's cousin Edward Azimov; and Edward's grandaughter. Isay's grandfather was born in Petrovichi. This picture was taken during Isay and Edward's visit to Petrovichi in 1999. The people of the village are very proud of the world famous writer who was born there.